The Indian army should not need an endorsement, but the way things are in various troubled parts of the country, a shout out to express admiration and gratitude for their courage is perhaps needed. What Aditya Dhar’s Uri: The Surgical Strike is about, is quite clear from the title. The actual military operation could not have taken so much running time and keep audiences interested, so there are ‘chapters’ before it. The film opens with an ambush on a military convoy by insurgents in Manipur. 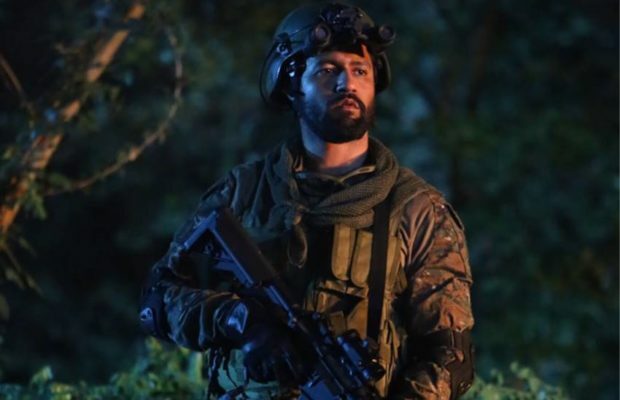 To avenge that, a small unit let by Major Vihaan Shergill (Vicky Kaushal) goes in and blows up an insurgent camp, without losing any soldiers. At the celebratory dinner, Vihaan expresses the desire to retire to look after his ailing mother (Swaroop Sampat), but the Prime Minister (Rajit Kapur playing Modi) insists he take a desk job and arranges a nurse at his home. There are a few scenes of the happy Shergill family, and then in a surprise attack by Pakistani militants (they came in dressed in Indian army uniforms) on the military camp in Uri, Kashmir, where Vihaan’s brother-in-law (Mohit Raina) is killed, along with other soldiers, who were caught unprepared. The PM and his security advisor, Govind, (Paresh Rawal obviously modelled on Ajit Doval) decide that enough is enough; India will have to assert her national pride and punish the perpetrators of the attack by surgical strikes on terrorist camps in Pakistan-occupied Kashmir. The film picks pace and tension from the point the decision is taken till the mission is accomplished. Govind, with an intelligence officer Pallavi (Yami Gautam) and a team of informers, spies and tech geeks, including a cheeky young drone operator (Akashdeep Arora), map out the hideouts of the terrorists, while Vihaan returns to active duty to plan and lead the attack. He gathers men from the units that lost their colleagues in the Uri killings, and gets their “josh” high to take revenge. The outcome is known, so Dhar tries to whip up emotions through lines like (“You came into our home and killed our brothers, now we will enter your homes and kill you”), and funnily, a hand-to-hand fight in a mission that’s meant to be quick and stealthy. The scenes of the mission are very reminiscent of Zero Dark Thirty, minus the subtlety. In what could have been an all-male film, Dhar includes small but significant roles for Gautam and Kirti Kulhari as a combat pilot. The film may be populist and pushing the aggressive agenda of the ruling party, but at a time when terrorism aided by the powers that be hangs over our heads, it serves to reassure people that there is no challenge the Indian Army cannot handle, given a decisive leadership. It is a worthy tribute to the armed forces. The claim of a New India that it pushes forward is debatable.